Built on many years of SharePoint consulting and implementing in various organizations, this extensive guide was built to help organizations maximize their value from SharePoint. Much of SharePoint’s potential rests on the usefulness of this tool for end users. A guide of this detail provides end users with step by step instructions to easily build and maintain applications and sites. Many industry experts and consultants claim this book to be a most valued resource for end users. Help your organization realize the potential benefits of SharePoint by empowering your users with this helpful tool. 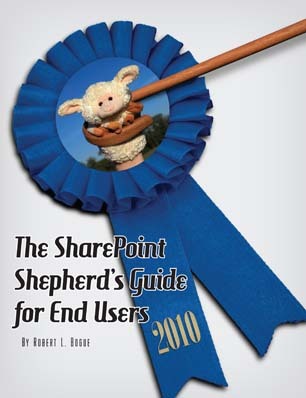 The SharePoint Shepherd’s Guide for End Users: 2010 provides End Users with extensive detailed tasks to help build sites and pages. With over 181 helpful tasks and 558 pages of examples, this guide will become a highly valued resource for your organization.